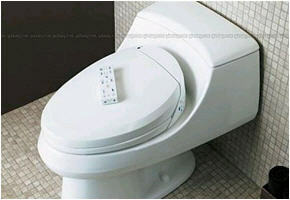 When installing a toilet seat bidet on your own, make sure to follow instructions to the letter. Not doing so can result in a few problems, including leaks on pipe joints (when they’re not fitted correctly) and unsanitary placement (the nozzle should be situated such that water spraying on your rear doesn’t return back to it – ewwww). When you’re using a bidet, it’s best to not turn the water on at full pressure right when you start cleaning. A sudden hard gush of water can feel like an unexpected shock, enough to throw you into a temporary state of mental agitation and, perhaps, and embarrassing scream. Instead, it’s always best to start soft, letting the water bathe your posterior gently before turning it up to facilitate a more through dirt removal. Warm water on a bidet doesn’t clean better than cold water. For the most part, warm water is intended to make the bidet more comfortable, the same way that a warm shower allows you to bathe without chilling. Warm water, as you may expect, uses electricity and using it indiscriminately can prove a wasteful resource consumption over the long run. We’ve told you about the toilet bidet dance before. Learn it, use it and live it. The bidet is not a toy. No matter how fascinating it may be (especially to first-time users), avoid playing with it. Use it for cleaning your posterior and genital areas, and steer clear of most any creative ideas. That will ensure your bidet lasts longer and stays free from damage from misuse.